I love these simple and clean setups and often wish my desk looked even half as elegant. Want your Mac setup featured? Send in pictures of Apple & Mac setups to osxdailycom@gmail.com and include some brief hardware details and what you use it for. We get tons of submissions so we can’t post them all, yet at least. @Hitokiri: Did you even read the text? It is the Thunderbolt Display connected to the MacBook Air. Its a display..- not an iMac. @Tom, waiting for new upgrades from Apple ;) MacBook Pro, iMac and/or Mac Mini Server, I just started with IOS development/designing, but it’s good enough to start. Beautiful desk! Makes me want to rearrange and simplify my own. That picture makes me horny! Am I crazy or do I just see a bunch of Macs on a glass table? Am I the only one annoyed that the photographer didn’t take two seconds to hide the power cord? And how the heck do people use the trackpad with their left hand? I still do, after 7 years…. I use the pad ALL the time with my left hand even though I am right handed. You can get used to use the pad with your left hand quicker than you might imaging;) Try it. Very neat and clean looking, beautiful. Something to be proud of. does the Magic Mouse work on the glass table top? Nop. No way it works. @Titony no the Magic Mouse is not working on glass, but I have not found a nice mousepad yet. @Fradrok I’m left handed, and works for me. And yes, forgot the power cords to hide. You can see the wires… ._. well, it looks nice but where did you hide the mouse pad for your magic mouse? The mouse will not work on a glass surface at all. Too Clean – the mini-Display port/Thunderbolt connector on the (user’s) right of the MacbookAir is not there, if the MagSafe power is connected to the left side its cable is bent back behind a an extreme angle. The user must be ambidextrous, using the touch pad with their left hand and mouse with their right. This is not a talent most of us come by naturally. I’m struggling to create a very similar setup (no iPad and 23″ – non-Mac display) I have cables out both sides of the MacbookAir and not able to find a track pad placement which does not tend to have me subconsciously leaning in my wrists to both type and point. 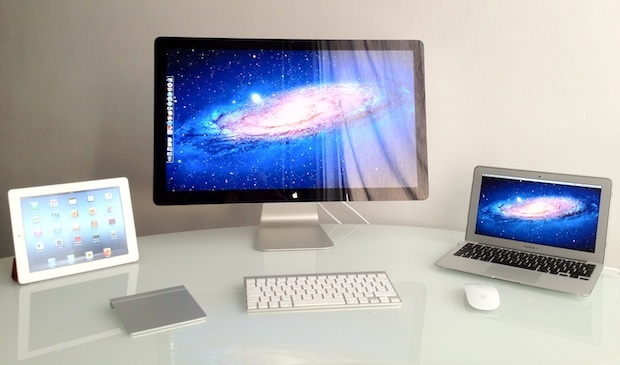 I agree it looks pretty and clean, and I ENVY the 27″ Thunderbolt display!